We are creating environmentally friendly, lightweight shopping bags that tell our 'Women's empowerment' and 'Care for the environment' story. This project will enable 1st world customers to participate in our project in a meaningful and rewarding way. The artwork on our bags celebrates our Australian/ Nepali partnership. Half the 1st range displays Mithila, a traditionally women's only art form. The other half, displays artwork created by Aboriginal women artists in Yuendumu, a remote community in the Northern Territory of Australia. The bags are being sewn in Nepal as part of an skills training and employment generating program. Our ultimate goal is to work with women artists in vulnerable communities all over the world. The shopping bags are simply stunning and even before launch, there has been a lot of interest from the business community. We are looking for partnership with retailers that are genuinely interested in making a difference, and at the same time, see this as an exciting business opportunity. We have also created an online store which will be fully operational by the end of January 2019. The profits from this project will be used to expand our social enterprise work, creating more skills training programs and employment. It’s other purpose, is to create a powerful lead-in, to selling our chef clothing internationally. We are using high quality RPET polyester, which is made from recycled plastic bottles, yet feels and looks like regular fabric. Weighing in at only 45gms, our shopping bags are compact and can easily live in a purse. No more forgetting to bring bags into the supermarket. Relative Nepal is an NGO, based in Janakpur. They are empowering their community through education projects and run five community schools. They empower women and preserve Nepali culture, by promoting Mithila art, a traditionally women's only art form. The women in their organisation are creating the artwork for our shopping bag project. 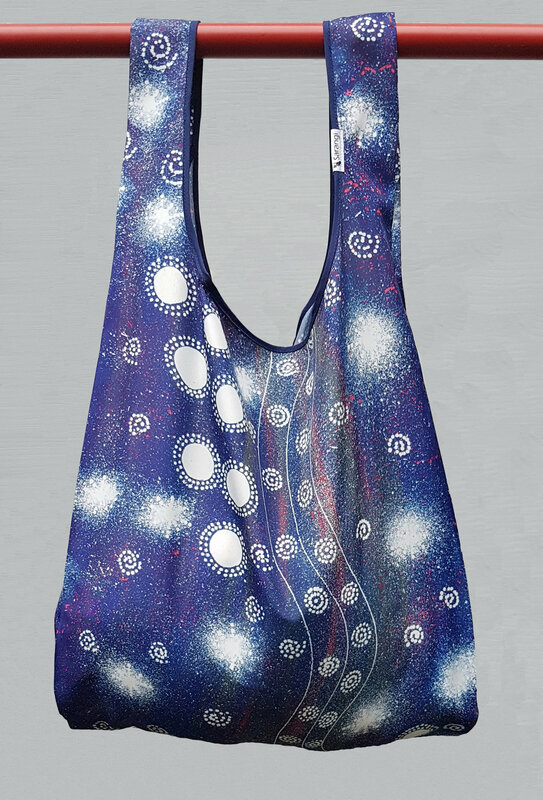 A proportion of the profits from the sale of the shopping bags will go directly to their projects. We will be providing sewing training for our chef wear enterprise. We are partnering Shakti Samuha, a major anti-trafficking organisation in Nepal. They were the first organisation in the world to be set up and run by survivors of trafficking themselves. They have won major international awards including the Ramon Magsaysay Award, which is the Asian equivalent of the Nobel Peace Prize. We have provided them with sewing machines and training. We are also providing marketing assistance by selling their bead-work at our restaurant, Sarangi Veg. Our first design features the Sarangi stringed instrument, the symbol of our enterprise. This bag honours the Gandharba, musician caste of Nepal. Because we value conservation of the environment, wildlife protection is a natural theme. This is a bag for people with a strong connection to nature. Traditionally in Nepal, after marriage, women go to the Banyon tree to perform a fertility ceremony. This artwork celebrates this. The ‘warrilyi ngurlu Jukurrpa’ (blue mallee [Eucalyptus gamophylla] seed Dreaming) comes from Pikilyi (Vaughan Springs), a large waterhole and natural spring to the west of Yuendumu, close to Mount Doreen. Napangardi/Napanangka women and Japangardi/Japanangka men are the ‘kirda’ (owners) of the blue mallee seed Dreaming at Pikilyi. Nangala women and Jangala men are the ‘kurdungurlu’ (custodians) of this Dreaming. ‘Warrilyi’ (blue mallee) grow alongside spinifex in red sand and on rocky hills. This plant is very fire tolerant; new leaves grow back quickly after fire. In October and November, creamy white flowers blossom. These flowers are reputed to contain honey. Water is also sometimes collected from the roots of the tree. In the blue mallee seed Dreaming, Napangardi and Napanangka women collect the ‘ngurlu’ (seeds) of the ‘warrilyi’ (blue mallee). ‘Warrilyi’ seeds are held in the nuts for up to six months, meaning that they are available even when other plant food sources are scarce. The women dry the nuts in the sun until they release the seed. They then clean and grind the seeds and cook them into damper on the top of the hill at Pikilyi. This blue mallee seed Dreaming is only associated with Pikilyi, and does not travel to other locations. Pikilyi is an important site associated with a number of different Dreamings. These include `yuparli Jukurrpa’ (bush banana [Marsdenia australis] Dreaming), `purrpalanji Jukurrpa’ (skinny bush banana [Rhyncharrhena linearis] Dreaming), kakalyalya Jukurrpa’ (cockatoo Dreaming), and `warna-jarra Jukurrpa’ (two snakes Dreaming). In the two snakes Dreaming story, Napangardi and Napanangka women picked lice off of the two snakes living in the waterhole at Pikilyi. In Warlpiri paintings, traditional iconography is used to represent the Jukurrpa. Concentric circles are often used to represent the bush foods that the women have collected. Dots can be used to represent the ‘ngurlu’ (seeds). used to tie around the forehead to cure headaches, and to bind cuts. The women stopped at Karntakurlangu, Janyinki, Parapurnta, Kimayi, and Munyuparntiparnti, sites spanning from the west to the east of Yuendumu. When they stopped, the women dug for bush foods like ‘jintiparnta’ (desert truffle [Elderia arenivaga]). The Dreaming track eventually took them far beyond Warlpiri country. The track passed through Coniston in Anmatyerre country to the east, and then went on to Alcoota and Aileron far to the northeast of Yuendumu and eventually on into Queensland. The Napaljarri-Warnu Jukurrpa (Seven Sisters Dreaming) depicts the story of the seven ancestral Napaljarri sisters who are found in the night sky today in the cluster of seven stars in the constellation Taurus, more commonly known as the Pleiades. The Pleiades are seven women of the Napaljarri skin group and are often depicted in paintings of this Jukurrpa carrying the Jampijinpa man ‘wardilyka’ (the bush turkey [Ardeotis australias]) who is in love with the Napaljarri-warnu and who represents the Orion's Belt cluster of stars. Jukurra-jukurra, the morning star, is a Jakamarra man who is also in love with the seven Napaljarri sisters and is often shown chasing them across the night sky. In a final attempt to escape from the Jakamarra the Napaljarri-warnu turned themselves into fire and ascended to the heavens to become stars. The custodians of the Napaljarri-warnu Jukurrpa are Japaljarri/Jungarrayi men and Napaljarri/Nungarrayi women. Some parts of the Napaljarri-warnu Jukurrpa are closely associated with men’s sacred ceremonies of a very secretive nature. Yanjirlpirri Jukurrpa (Star Dreaming) tells of the journey of Japaljarri and Jungarrayi men who travelled from Kurlurngalinypa (near Lajamanu) to Yanjirlypirri (west of Yuendumu) and then on to Lake Mackay on the West Australian border. Along the way they performed ‘kurdiji’ (initiation ceremonies) for young men. Women also danced for the ‘kurdiji’. The site depicted in this canvas isYanjirlypiri (star) where there is a low hill and a water soakage. The importance of this place cannot be overemphasized as young boys are brought here to be initiated from as far as Pitjanjatjara country to the south and Lajamanu to the north. In contemporary Warlpiri paintings traditional iconography is used to represent the Jukurrpa, associated sites and other elements. Often depicted in paintings for this Jukurrpa is the female star Yantarlarangi (Venus - the Evening Star) who chases the seven Napaljarri sisters for having stolen the night from her.